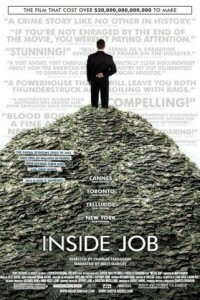 “Inside Job” is the first theatrically released documentary to provide a comprehensive analysis of the global financial crisis of 2008, which at a cost over $20 trillion, caused millions of people to lose their jobs and homes in the worst recession since the Great Depression, and nearly resulted in a global financial collapse. Through exhaustive research and extensive interviews with key financial insiders, politicians, journalists, and academics, the film traces the rise of a rogue industry which has corrupted politics, regulation, and academia. It was made on location in the United States, Iceland, England, France, Singapore, and China.